The Symmetry controls are in the Transform palette. Press Transform > Activate Symmetry. Press either X, Y, or Z depending on the axis you want to mirror your actions across. 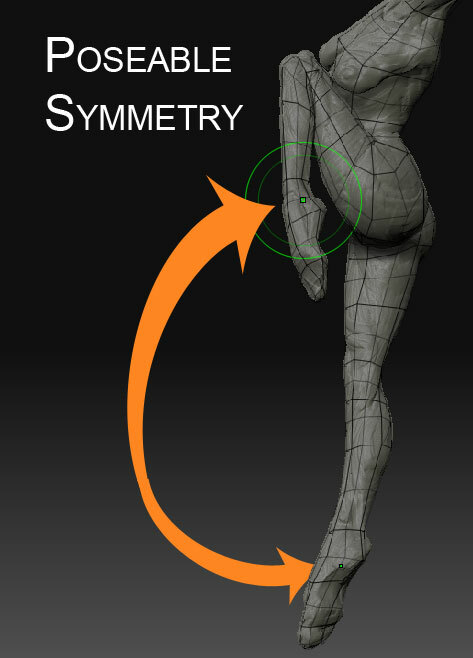 Poseable Symmetry utilizes ZBrush’s SmartResym technology to automatically create symmetry based on topology instead of world space. Normal symmetry requires the model to be the same shape across either the X, Y or Z axis. When you pose a model, however, it is no longer the same across any axis and can not be sculpted symmetrically using normal symmetry tools. Poseable Symmetry solves this by using symmetry based on your topology. The topology must be symmetrical across one axis. However, it can not be symmetrical across two or more axis such as a sphere or cube would be. It does not use UVs and is 100% dependent on your mesh being topologically symmetrical from one side to another. To use Poseable Symmetry simply choose the axis you want the symmetry to work across in the Transform Palette. Then press Use Poseable Symmetry. Set Tool > Geometry > SDiv to the highest level of resolution you will be sculpting at. Press either X, Y, or Z depending on the axis of the topology you want to mirror your actions across. If you model’s topology is not 100% symmetrical from one side to the other then the tool will fail. If your model is symmetrical in more than one axis it will also fail. For example, a sphere is symmetrical in all 3 axis. Poseable Symmetry is defined by a green brush radius. If you divide your mesh after establishing Poseable Symmetry, you will revert to normal symmetry. Simply press Use Poseable Symmetry again to go back to Poseable Symmetry. If you are encountering symmetry around 50% and your model had n-gons it is possible that your model’s edgelooping is not 100% the same from one side to the other. If your model came from earlier versions of ZBrush and had n-gons in the base mesh then the edgelooping may not be consistent across axis. 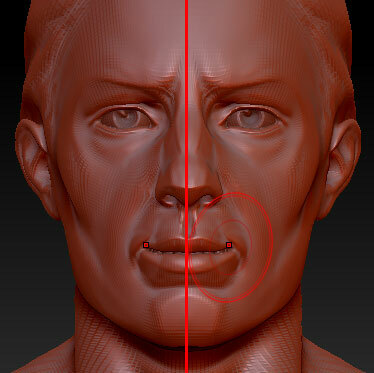 ZBrush has feature when importing OBJs with n-gons to create symmetrical triangles. Set Transform: Radial Count to the number of times you want to mirror your actions symmetrically along the surface.